Heinz just created a fancy ketchup with a totally new look — but is it tasty? The condiment company that released Mayochup is at it again. Heinz just brought the term "fancy ketchup" to a whole new level. Many people who love ketchup actually don't know why "fancy ketchup" is, well, fancy. It actually refers to how a batch of ketchup is graded by the United States Department of Agriculture in the same way that other foods, like meat, are classified. Still, for some, that highest caliber, A-grade condiment may not be fancy enough. For those people — the true kings, queens and french fry fiends among us — Heinz has created a new product that it's calling Ketchup Caviar. A limited batch (150 jars, to be exact) of the bright red delicacy will be available just in time for Valentine's Day. So don't even worry about getting flowers, OK? The company is calling its promotion a "ValenHEINZ to remember," which does have a better ring to it than the recently released, yet slightly controversial condiment dubbed Mayochup. May-OK would have been cute ... but that's behind us now. A Heinz spokesperson told TODAY Food that the caviar ketchup balls taste just like Heinz Tomato Ketchup because they literally are just ketchup — no fish eggs here! 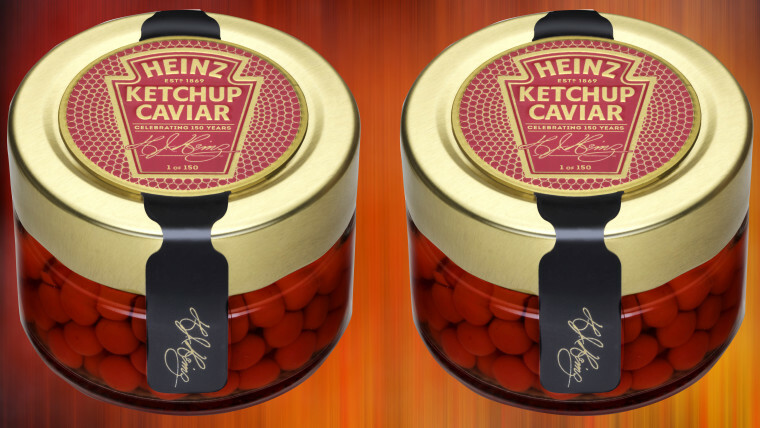 The company teamed up with "caviar specialists" to ensure that the brand's classic ketchup flavor and consistency remained after being formed into a caviar-like shape using a proprietary molecular gastronomy technique. In the mid 2000s, award-winning chefs like Wylie Dufresne popularized the technique of food "spherification" by either flash freezing liquids or combining them with a seaweed extract (which acts as a stabilizer) and then dropping that mixture into a calcium chloride or calcium glucate lactate solution to form little balls. Heinz would not reveal exactly which technique was used to make its new caviar. However, just like liquid ketchup, the product can be used to top hamburgers, roasted potatoes, hot dogs and more. Just think of the world as your oyster ... and Heinz Ketchup Caviar as your pearl. A select few fancy folks will be able to snag a jar by visiting Heinz Ketchup's Twitter account beginning at 7 a.m., on Jan. 24 through Jan. 28. Within hours of posting the news, thousands of ketchup lovers had commented on the new product — many with hilariously dramatic pleas to score a jar of the coveted item. Here's to a happy "ValenHEINZ" day!